Whether you need a craft project to celebrate Ramadan or simply want to embrace Islamic culture and art, Muslim crafts can be both beautiful and symbolic. Crescent shape - The crescent moon is a powerful symbol in Islamic culture. In fact, the crescent signifies the beginning of Ramadan, the Muslim holy month. Green - Many Muslims believe that the color green is beloved by the prophet Muhammad. Dates - These sweet fruits are considered a delicacy in many Muslim countries. They are often associated with celebration. 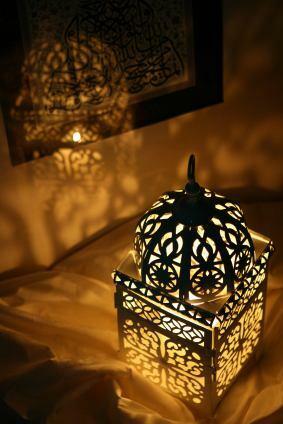 You can make a fanoos, or Middle Eastern lantern, using supplies from your local craft store. Traditionally, these lanterns include colored glass panels, but you can make a simple paper version to decorate your home. This project is also appropriate for older kids. Cut a 12x12 cardstock sheet in half to form two rectangles. Locate the midpoint on each short side of the rectangle, and mark it with a pencil. Mark a spot about three inches from each end on the long sides. Cut from these points to form a shape with two pointed ends. Repeat this process to create four pieces. These will be the four sides of your fanoos. Use the scissors to cut a window in each of these sides. Depending on your skill level, you may want to make elaborate paper cutting designs in the window. Place a sheet of vellum or tissue paper over the window, and tape it in place. Repeat with all four sides. Tape the four sides of the fanoos together to create a three-dimensional lantern with a tapered top and bottom. Use the hole punch to make a small hole in the top of the fanoos. Tie a piece of string through the hole so you can hang it from your window. At the end of Ramadan, Muslims celebrate the holiday of Eid. This holiday represents an end of fasting, so food is a big part of the celebration. Many families also go visiting during this time. These Eid date gifts are the perfect thing to bring during holiday visits. This is a quick and easy project, so you can make gifts for each family you visit. Use the paper punch to cut crescent shapes out of the paper bag. Consider punching the crescents all along the upper edge of the bag. With the gold marker, write an Eid-themed message on the front of the bag. Consider something like "Happy Eid" or "Wishing You a Blessed Eid." Wrap the dates in gold tissue paper, and place them carefully inside the bag. Arrange another sheet of gold tissue paper so it sticks out the top of the bag. Tie with a green ribbon, and give the gift to friends and family. Islamic School Resources has Muslim art projects for kids of all ages. Artists Helping Children offers instructions for a variety of Muslim crafts. A Muslim Child Is Born has a variety of craft ideas for young children. Happy Muslim Mama has an extensive list of Muslim craft projects. Common Sense Patterns offers an array of sewing patterns for traditional Muslim clothing. Crafting is a great way for Muslim people to celebrate their faith, and it also presents a wonderful opportunity for all people to learn about the art associated with this religion.